Chinatown residents speak on issues they face in the neighbourhood at People’s Vision launch on July 16, 2017 at nə́c̓aʔmat ct Strathcona Library. Photo credit: Sid Chow Tan. (Vancouver, Unceded Coast Salish Territories, July 17, 2017) – Yesterday, July 16, 2017, Chinatown Concern Group (CCG) and Chinatown Action Group (CAG) launched an better vision for Chinatown called the ‘People’s Vision.’ The vision document is a response to failed City policies, such as the Chinatown Economic Revitalization Action Plan (CRAP), that continue to gentrify the neighbourhood and displace low-income residents. In September, Vancouver City Council will consider the CRAP, a new zoning plan for Chinatown that will let developers build more expensive condos up to 90 feet tall in Chinatown without including any social housing. If it passes, more gentrifying projects like 105 Keefer will take over Chinatown and inevitably raise rents and the cost of living for low-income residents. Instead, the community is proposing the People’s Vision for Chinatown, a strategy for the social and economic development of the community. From 2015 to 2017, 500 Chinatown residents, businesses, and community members shared their vision of the community through surveys, interviews, and facilitated “tea time” discussions. The top issues community members are concerned with are: increased cost of living, unaffordable housing, social isolation, safety, political marginalization, and racism. Low-income Chinatown residents celebrate the defeat of Beedie’s 105 Keefer rezoning application. Photo credit: Lenee Son. Vancouver, Unceded Coast Salish Territories – The Chinatown Concern Group (CCG) and Chinatown Action Group (CAG) applaud the Vancouver City Council’s 8-3 decision to reject Beedie Living’s rezoning application at the 105 Keefer site in Chinatown. This decision is an important victory for the Chinatown community, but CAG and CCG vow to continue the fight until 100% welfare-pension rate social housing and a public intergenerational community space are secured for this site. Council echoes the needs of the community to look for deeper solutions to the housing crisis in Chinatown instead of another condo project that would provide a measly 25 units of social housing. “We commend Vancouver City Council for choosing the side of Chinatown’s low-income residents over corporate profit, but the fight is not over. There is a housing crisis for Chinese seniors and other low-income people in the neighbourhood, and we are unwavering in our demand that this site can only be used to meet the pressing needs of our community,” Beverly Ho, CCG Organizer, says. (Vancouver, Unceded Coast Salish Territories, May 29, 2017) – In the face of major opposition and community mobilization, Vancouver City Council deferred the decision on the rezoning application to June 13th, 2017. This follows a week-long public hearing at City Hall, where Chinatown residents, organizations, and community members packed City Hall to voice their opposition to the proposed condo development. Chinatown Concern Group (CCG) and Chinatown Action Group (CAG) continue to call on Vancouver City Council to reject Beedie Living’s rezoning application at the 105 Keefer site in Chinatown. “If Vancouver City Council approves the rezoning, they will have chosen corporate profit over the needs of Chinatown’s low-income residents. Our fight is not over,” Beverly Ho, CCG Organizer, says. The battle against 105 Keefer symbolizes the broader ongoing struggle against gentrification which was accelerated by the upzoning of Chinatown in 2011 by City Council. The rezoning process also reveals a deeply flawed process of democratic engagement. (Unceded Coast Salish Territories – May 23, 2017) On Tuesday, May 23rd, Chinatown Concern Group and Chinatown residents will deliver a petition with 2430 signers directly to Mayor Gregor at Vancouver City Hall demanding protection of low-income residents, not corporate developer profits. Just in the past week over a thousand people have signed the petition in anticipation of the Public Hearing on May 23rd. To visit the petition page online, click here. WHAT: Chinatown residents will deliver a petition with 2430 signatures demanding Mayor Gregor reject of 105 Keefer St. Rezoning Application at the Public Hearing and protect low-income residents, not developer profits. WHO: Chinatown Concern Group is a group of Chinese residents organizing to ensure Chinatown is thriving, livable and affordable. VISUALS: A box of petitions and 100 residents, seniors, and community members with colourful signs, noisemakers, and a large banner, chanting and speaking on the steps of Vancouver City Hall. Media Advisory: Low-Income Residents: Mayor Gregor, Protect the Heart of Chinatown! LOW-INCOME RESIDENTS: MAYOR GREGOR, PROTECT THE HEART OF CHINATOWN! (Vancouver, Unceded Coast Salish Territories – May 16, 2017) On Tuesday, May 23rd, residents, organizations, and community members will descend on Vancouver City Hall to demand that Mayor Gregor protect low-income residents and the heart of Chinatown, not corporate developer profits. After four revisions and over two years of consultations and mobilizations, Chinatown Concern Group, Chinatown Action Group, and other youth organizations won small concessions from the 105 Keefer St. project: 25 senior units, temporary space for a private seniors’ organization, and a 23% reduction in market units (137 to 106 units). Still, the project threatens to displace Chinatown’s predominantly low-income community. 106 market units will dramatically increase rents in the neighbourhood and the token 25 senior units are likely to be still out of reach for low-income tenants. Instead, Chinatown Concern Group is calling for 100% welfare-pension rate social housing and public and permanent cultural community space. The City of Vancouver is proposing to gentrify Chinatown through a mass rezoning plan called the CRAP (Chinatown Economic Revitalization Action Plan). The CRAP will open the floodgates for condo development in Chinatown, raising rents, increasing evictions, and accelerating the displacement of the neighbourhood’s most vulnerable residents and small businesses. The CRAP proposes drastically increasing building heights (up to 150 feet tall, or 14 stories) and building frontages (up to 200 feet wide), while gutting the existing public consultation process of open houses and public hearings. If the CRAP passes City Council, projects like the 12-story 105 Keefer condo development would not be required to undergo zoning review or public consultation at all. Instead of approving the CRAP, the City should implement policies to honour the history of Chinatown by ensuring that the neighbourhood remains permanently affordable and welcoming to seniors, workers, and low-income people of all backgrounds. Implement policies put forward by Chinatown residents, including the demands of Chinatown Concern Group. 1 Day Left – Protect the heart of Chinatown! Take action before it’s too late! You may use the following letter (below) to cut and paste into your comment form. Feel free to personalize and make the letter your own. 介紹新關注組社區組織者:何盈欣! Introducing CCG’s new staff community organizer: 何盈欣 Beverly Ho! Hi everyone! My name is 何盈欣 Beverly Ho, and I’m so honored and happy to be on staff with the 唐人街關注組 Chinatown Concern Group! I’ve been involved with the group for around a year now, as well as with 青年長者合作組 Youth for Chinese Seniors and 華埠行動小組Chinatown Action Group. Getting to know CCG has been amazing; their superstar personalities, struggles, values, and victories! I know it’ll be challenging and hard work, but I’m excited to be learning and growing and fighting with Concern Group and CCAP! 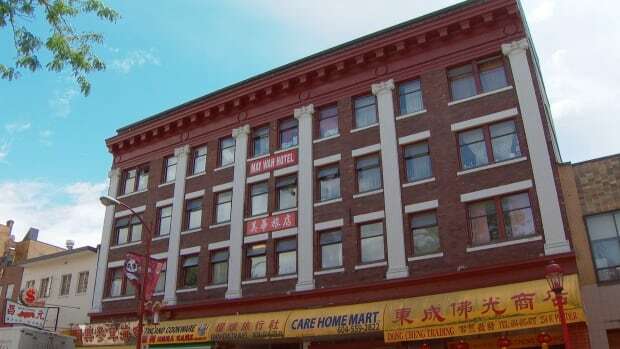 The May Wah Hotel is a City of Vancouver-designated heritage building that houses more than 100 low-income tenants. Chinatown’s historic May Wah Hotel may be saved after all. A prospective buyer has stepped up to try and purchase the heritage building with the intention of preserving its low-income housing units.